Manheim, PA – B.R. 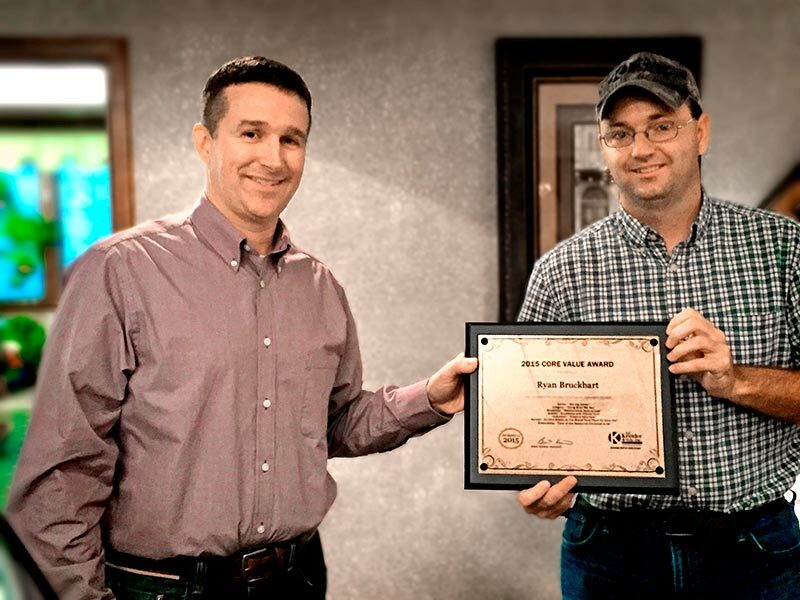 Kreider & Son, Inc., an excavating, paving and site management company based in Manheim, PA, recently recognized Ryan Bruckhart, Trackhoe Operator, with the B.R. Kreider Core Value Award. The award is presented to the employee who best represents the seven core values of the company; Safety (a commitment to the best safety practices), Integrity (always doing things the right way), Relational (encouraging positive relationships), Quality (providing premium service with the utmost care), Innovation (finding new and better ways to provide great service and value), Servant (do unto others as you would have them do unto you) and Stewardship (sharing time and talents with the community). Bruckhart was one of four finalists for the award and all potential recipients were nominated by a fellow employee. A resident of Lititz, PA, Bruckhart joined B.R. Kreider & Son in 1998. Brent Kreider, President of B.R. Kreider & Son (left) presents Ryan Bruckhart with the B.R. Kreider Core Value Award.